JIC Brake Pads - Real S2 Performance Pads - Dezod Motorsports Inc - Home of the automotive performance enthusiast since 2002. 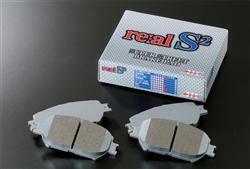 The REAL S2 Brake Pads are ideal for street performance and everyday usage on factory calipers and rototrs. They provide excellent braking during both everyday driving and more spirited driving conditions and pads are also engineered to give better braking performance without the headache of excessive dust.